David D. Haring was the son of David A. Haring by his second wife. He was born on February 23, 1800 in present day Tappan, Bergen County, New Jersey. His father died within a year of his birth. His mother, Mariah Alyie, married Jacob Echerson in 1803. After David’s mothers’ remarriage, they moved to present-day Norwood with his grandfather. On September 15, 1821, David married Leah Verveelen. Leah’s family was neighbors of the Echersons and Harings. Shortly after their marriage, David purchased forty acres of land from his in-laws. His family lived on the land for the rest of his life. Little is known about David’s life. He likely began his career as a craftsman around the time he married Leah. 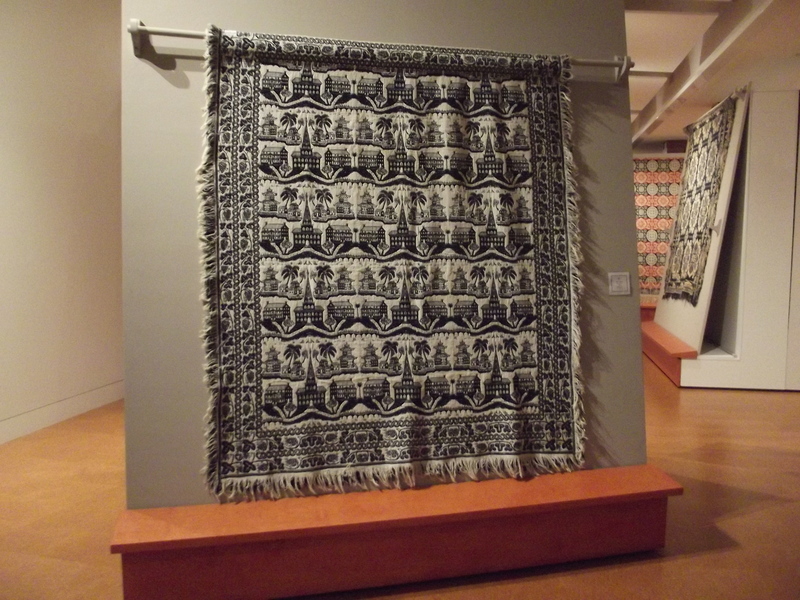 David was a coverlet weaver, but he also weaved rugs, Indian Rose blankets and table-covers. 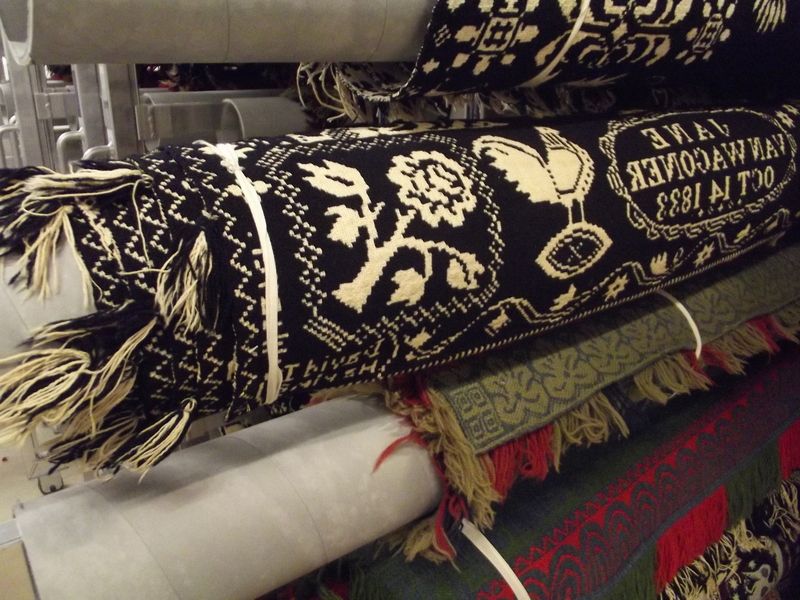 He was one of two coverlet weavers in Bergen County, New Jersey that used a Jacquard attachment on their loom. Haring passed away in 1889. He left an estate of over $42,000 to split between his two daughters. Typically, Haring used a rose with four leaves as his primary logo. Though his logo does not appear on the Haring coverlet on display, the McCarl Gallery does have a coverlet depicting this logo. These coverlets also included his name or initials in the corner block. The corner block often had his occupation, location, date and clients name. Haring coverlets are also known for having a rooster or a rooster and a hen with the client’s name and date. The McCarl Coverlet Gallery has five Haring coverlets in our collection. Clarita S. Anderson, “American Coverlets and Their Weavers.” Ohio University Press. 2002. Kevin Wright, “Weavers of Bergen County.” www.bergencountyhistory.org. 1983. Beautiful coverlet. The variety of architecture depicted is interesting. Thank you for sharing David Harings work. Thanks for reading! 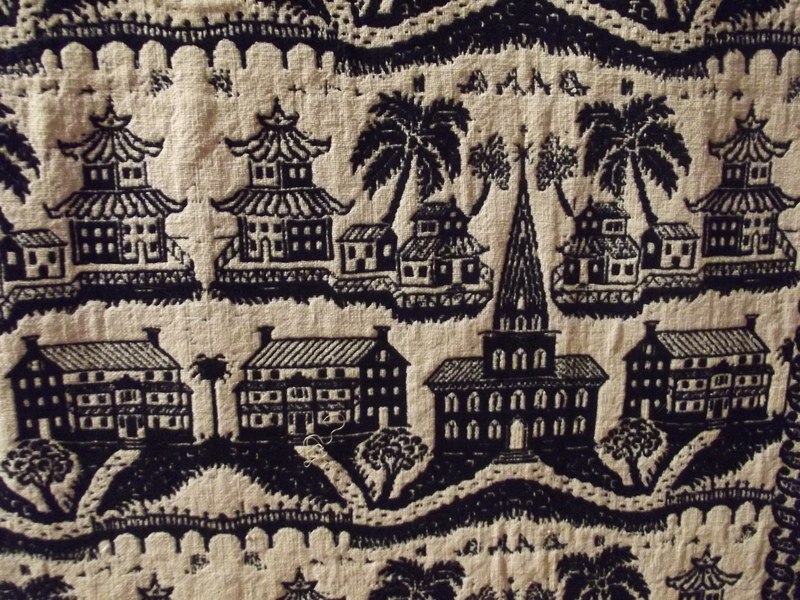 We will be doing a post soon on our current exhibit, “American Architecture in Coverlet Design”– so stayed tuned for some more “woven” architecture including houses, churches, manisons and more!